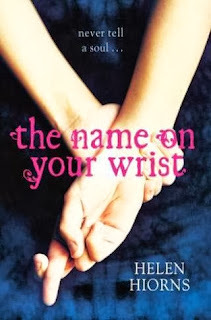 I was very intrigued to read The Name on Your Wrist by Helen Hiorns after it was selected to be the first winner of the Sony Young Movellas award. Helen Hiorns is only 19 years old and a university student at Sheffield! I'm very impressed and in awe that so many young people are as creative and dedicated enough to have completed a novel and to have entered such a competition. So, well done Helen! The Name on Your Wrist was certainly an interesting and original concept. It tells the story of this world in which everyone will have the name of their soul mate, or carpinomen, written on their wrists. This carpinomen is a big secret, you're not supposed to reveal your name to anyone. This guarded knowledge is power and people search their entire lives to find their soul mate. I think the thing that I found the most enjoyable about The Name On Your Wrist is the exploration of what happens when things go wrong in this area? Placing so much emphasis on happiness and fulfillment on another person can leave one open to unhappiness - for those people who never find their carpinomen, for those people who have found their soul mates but don't feel as strongly about them as they believe the should. Questions are definitely raised here about having a choice in who to love and about the consequences that go along with falling in love with someone who is not your carpinonem. I was very surprised by this book. Especially because for me at least, the tone of this book felt a little bit bleak in parts and as much as Corin, the main character, tries to cut herself off from other people, I was expecting myself to feel detached from the story as well. And while I was never fully engaged in Corin's story everything about the book and all of the questions that are raised managed to crawl under my skin. Even days after reading The Name On Your Wrist I would suddenly recall some aspect of it and the impact of this story stayed with me for far longer than I expected. This is a very strong and thought-provoking debut. I will definitely look out for more from Helen Hiorns and I eagerly await news of whether or not the Sony Young Movellas award will become a regular thing. I sure hope so! I'm fascinated by the idea behind this novel. I love the idea of all of the questions it raised for you and it's just such an original idea. So glad I nabbed a copy from NetGalley! I hope you enjoy it, Sophie! It is, I was very pleasantly surprised by this book.